Secret correspondence between civil servants reveals a fascinating insight into who is really in command during a terrorist crisis under the government’s contingency plans. Officials in government departments and agencies spent more than a year exchanging confidential letters and memos about the impact of the siege at the Libyan embassy in 1984 on contingency planning for terrorist or terrorist-type situations. I reveal today how senior figures at the Home Office are prepared to send the SAS to a terrorist crisis over the heads of police, according to an extraordinary confidential memo distributed to a select group of civil servants in the department. On April 17, 1984 – 35 years ago exactly on Wednesday – uniformed officers from Scotland Yard were policing protests against Libya’s ruling regime outside the country’s embassy in St James’s Square in central London. The protestors were opposed to Libya’s then leader, Muammar Gaddafi, who was killed in 2011. During the demonstration, gun-fire rang out. Several protestors were injured. 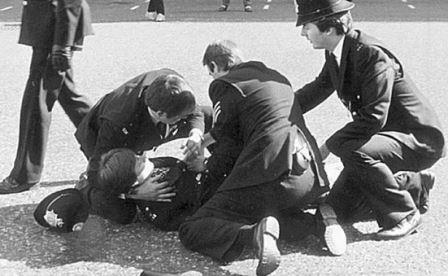 A young WPC, Yvonne Fletcher, lay wounded after she was also shot. She would die later in hospital. An 11-day siege of the embassy followed until, under a diplomatic agreement struck between London and Tripoli, those inside were allowed to leave and fly to Libya. Police sources tell me that the building in St James’s Square was not recognised as an embassy at the time under the Vienna Convention on Diplomatic Relations. It was known officially as the “Libyan People’s Bureau”. The Home Office collected the confidential correspondence and associated documents on what officials called the “wash-up” of the episode into a file, entitled, “Libyan Embassy siege debrief”. The department had kept the file closed despite being more than 30 years old, even withholding it from the National Archives, until I filed a request for it under the Freedom of Information Act (FOIA) for the FOIA Centre. A former police officer had asked for my help in making the secret file public. The Home Office took just over a year to supply 43 pages of the requested documents. It redacted some of the material to withhold information, variously on the basis that it related to the intelligence or security services, national security, international relations, law enforcement or on the grounds that it was personal information. In addition to the 43 pages disclosed entirely or partially, a further 43 were redacted totally. The declassified material includes eight-pages of what appears to have been a nine-page report of July 1985 by the Home Office called, “Lessons to be drawn from the Libyan People’s Bureau incident”. It also includes correspondence between Scotland Yard or Whitehall departments and the Home Office in advance of the paper on what those lessons should be, including comments on a draft of the report. The excluded material is bound to include input from the intelligence services. The correspondence in the file begins a few days after the end of the siege at the Libyan embassy in April 1984. Michael Partridge, the second-most senior official at the Home Office, raised a series of concerns about security surrounding the Cabinet Office briefing room, known either as COBRA or COBR, in a letter of May 4, 1984 to a counterpart at the Cabinet Office, David Goodall. The fact that the Home Office has disclosed to me, in response to my FOIA request, Partridge’s concerns set out below suggests that it is satisfied that the government has since addressed these potential security weaknesses. Partridge, one of the most senior officials at the Home Office who would later become permanent secretary at the now-disbanded Department of Social Security, also tells Goodall that too many people attended COBRA meetings with ministers. The physical security of COBRA is not very great. Now that its existence and rough position are known, that is disturbing. I for one would not feel sanguine about one’s security from attack (eg through the ground floor windows from Horseguards Parade) if some terrorists decided to attack during an incident. Its other role as a war room makes the position even more worrying. You raised a number of important but detailed points which I believe would be best examined by a small Working Party at an appropriate level. This group could also examine any other areas of difficulty identified by other Departments primarily concerned. Partridge agrees to the proposal in a letter of May 16, 1984. I’m worried about the deafening silence on a wash-up, where I think the initiative lies with Cab. Off. I certainly want to take part: and I think the nature of this incident provides a particularly useful opportunity to review the whole system. The Home Office did not disclose the record in reply to my FOIA request. As you will see, a number of areas for improvement in our arrangements have been identified, and action is in hand (in some cases, already completed) on them. In the light of the actions identified at the Meeting, you may feel that a further Meeting at your level is unnecessary. The Home Office plan to hold their own Meeting to “wash up” on the Government and Police response to the incident as a whole. Brennan later rose in the Cabinet Office to head of the honours and appointments secretariat, reporting to the chairman of the joint intelligence committee. He appeared before MPs in that role in 2009, when Quentin Letts described him in the Daily Mail as “in effect, the Mr Knighthoods of Whitehall” and “a wonderfully old-fashioned civil servant”. This seems to have been a comprehensive, thorough and sensible review, and I agree with the conclusions and the proposed action. It has been the practice in the past for the Home Office to call an inter-agency meeting within a few weeks of a major terrorist incident in which COBR has been activated. The purpose of the meeting is to identify the lessons learned and to assign to appropriate agencies any follow up action. The Home Office then produces a TO paper describing the lessons as well as later papers on the progress made in implementing them. 2. In the weeks immediately after the St James’s Square incident we were all too busy putting our own houses in order to find time for such a meeting. In my view the passage of time has diminished the need for such a meeting because there have already been several in-house debriefs such as the one Denis Brennan held to consider the points you had made about COBR. The Metropolitan Police too have had their own wash-up. Hilary suggests, in place of an inter-agency meeting, dealing with any issues by correspondence. No reply from Partridge is included in the disclosed file. But a few days later he writes to various government departments and agencies to ask for views on lessons learnt from the “Libyan incident” and on any points to improve contingency plans. Again, none of these letters is disclosed, although the Home Office has released some of the replies. There were occasions when liaison between departments was inadequate and when the media tried to drive wedges. It is important therefore that wherever possible representatives of each principal department involved should be present at each other’s briefing and be ready to participate where necessary. With No 10’s agreement this should include daily lobby briefings. Mower sends a copy of his note to Bernard Ingham, press secretary to the prime minister, Margaret Thatcher. Ingham was responsible for lobby briefings then given off the record to accredited political journalists. It is worth making the point that in spite of the comments above on particular aspects of the operation, I believe overall the COBR machinery was recognised to have worked pretty well throughout the incident. I know that there was criticism at the time of St. James Square of the size of the FCO delegation at the COBR meetings. I think this criticism was valid. We shall try to ensure in future that FCO presence is kept to a decent minimum. Several of the letters understandably complain that a debrief so long after the event is much less useful as memories fade… I know there have been other preoccupations, but following any future incident I am sure there is no alternative but to take immediate steps to earmark a date for a debrief meeting within no more than two or three weeks of the incident ending. I have certainly learned my lesson from this occasion but I should be grateful if you would make sure that the point is recorded on any appropriate papers where it would serve as a reminder to future generations. Harrington refers to a reply of September 19, 1984 by a Dr Harte of the Ministry of Defence (MoD), which has not itself been disclosed. Harte is not fully identified, but is understood to have been Dr Michael Harte of the MoD’s “DS6”. In the particular circumstances of this incident, police representation in COBR was useful but it was only possible because of the geographical proximity of the scene. Outside London, or even a little further away from Whitehall within London, such an arrangement would be quite impossible. Where it is possible, attendance by the Police Commander at particular meetings can be very valuable in ensuring an identity of understanding of the different points of view at the scene and in COBR. That identity of understanding is the overriding objective, and with that in mind I would make two stipulations. First, if the Police Commander attends COBR the Government liaison officer must do so too: otherwise the latter will cease to be sufficiently well informed about perceptions and events at both ends to be able to carry out his liaison function between COBR meetings. Second, where it is geographically impossible for the Police Commander to attend COBR meetings it would be a great mistake to appoint a police liaison officer from the force handling the incident to sit in COBR (which is in the mind of some in the MoD who are forwarding this suggestion).The danger of such an approach would be that the Police Commander would talk to “his man” in the COBR while Government representatives would talk to “their man” at the scene. That is not the way to create the identity of purpose, perception and team work which our present procedures seem admirably to offer. It is understood that, similarly, they serve as a bridge between police at the scene and intelligence agencies. GLOs act as the link between COBRA and the police commander at the scene, especially when the latter cannot attend briefings at the former because of operational demands. To make sure that the SAS arrive unobtrusively on the scene before the Police Commander has time to take fright at the idea of their arriving. Once they are there, he will find that they are tactful and unobtrusive in their advice. This passage suggests that, with the approval of the Home Office, military or intelligence figures may decide to intervene in such a crisis, rather than await a police request to them for assistance. This may spark a clash between police and other security agencies over who is really in command of a comparable situation. The Harrington memo especially raises questions at a time when Britain remains on high alert for a terrorist attack. Harrington sent the memo to two colleagues in F4 Division and Partridge, the deputy under-secretary of state at the Home Office. It dates from more than 34 years ago, so there may have since been changes to the policy. There is no sign that it went to a minister. The SAS is not known to have had a role in the siege at the Libyan embassy, although police sources tell me that it was at the scene and awaiting possible orders to carry out a raid. The specialist unit famously ended a hostage crisis at the Iranian embassy in London just four years earlier. There were times when it was in danger of bypassing the COBR and putting points to, or pressing for information direct from, the scene. That both overstrained the resources at the scene, and ran the risk of destroying the identity of information between the scene and COBR which is crucial to the successful coordination of such operations. In April 1985, the Home Office distributed within Whitehall a draft paper on “lessons to be drawn” from the “Libyan incident”. The Home Office did not disclose the draft in reply to my FOIA request. We consider that the direct police input into COBR was invaluable in this case and would not wish the future consideration of the same facility to be dismissed. The risk of confusion in communication outlined at paragraph (h) exists equally where the view of the Chief Officer is communicated by a third party. We entirely agree with you that the direct police input into COBR was invaluable. Without laying down hard and fast rules (because particular incidents differ from each other) the paper will say very firmly that if circumstances permit, the opportunity for the police commander and the Government Liaison Officer to attend appropriate meetings at COBR should be considered. There is no doubt that during the Libyan incident, those arrangements were a material contribution to maintaining an identity of understanding between COBR and those at the scene. But there are a number of reasons why we would not want to build into our plans a standing arrangement to have a police officer in the COBR. There are some formal problems (COBR is technically a Cabinet Committee) but they are not important. The crucial reasons are those relating to the nature of the coordination process between COBR and the police commander at the scene. Once COBR is opened, it becomes the focus for all Government information, and all Government decision taking, relating to the incident. It is, as you know, in permanent session. The link between the COBR and the scene is the Government Liaison Officer. It is his job to know the role of COBR and the sort of information and advice which it needs from the scene. It is also his job to know enough about the police service, and (by close contact with the police commander) about the conduct of the particular operation to ensure that the police commander is adequately informed – but not overburdened with useless information – about what is going on in COBR. In short, it is his job to present police interests to COBR, and COBR interests to the police. There is an ever present risk of confusion in communication between COBR and the scene: that is unavoidable, and that risk is lessened if the geographical circumstances permit the police commander to thrash any particular issues out face to face in COBR. But in any case where the COBR and the scene of the incident were insufficiently close together, or where the pattern of activity at the scene of the incident did not permit the police commander to leave it, we do not think that the risk of confusion in communication would be lessened by setting up a second line of communication into COBR. You will be well aware from the Libyan incident that the issues arising on such occasions do not fall neatly into boxes clearly labelled “police business” or “Government business”; the two are inextricably interrelated and for that reason we regard it as imperative that there should be a single line of communication with COBR. Even in an incident of the complexity of that which you and I experienced, that link was never unbearably overloaded. If it were doubled up by having a police officer in COBR, I believe the risk of confusion would be seriously increased, not diminished. In particular, there would be an inescapable risk that officials in the COBR would tend to talk to “their man” – ie the Government Liaison Officer – at the scene, while the police at the scene would tend to talk to “their man” – ie the police officer – in COBR. I believe that would help neither the Home Secretary in COBR nor the police commander. Personalities apart (I have to say that) I do not think that police officers in command of such incidents have felt themselves badly served, or inadequately informed about what was going on in COBR, under the present arrangements. The important factor is to create quickly the feeling of team work between different agencies involved at the scene and between the whole of the team at the scene and that in COBR. We therefore propose to continue with present arrangements, while still having in the front of our minds the desirability of the police commander attending the COBR for appropriate meetings whenever circumstances permit. Thank you for your letter of 26th July 1985, advising me of the position of COBR in relation to police at any future incidents. I am sure that we are of one view on this question. Would it be possible to reduce the number of items in paragraph 31 on which action appears still to be outstanding. He distributed his letter to six officials across Whitehall, including one identified as Trevor Jones of “Box 500”, which is how MI5 is colloquially known among civil servants, from its official address during World War II. Three secretaries to the Cabinet Official Committee on Terrorism – including Harrington of the Home Office and Brind of the Cabinet Office – submitted the report by the Home Office to members of the committee, made up of civil servants who represent relevant Whitehall departments, on July 29, 1985. The essence of the role of the GLO is to act as the single channel of communication in both directions, on other than purely intelligence matters, between the COBR and the scene. A balance has to be struck between the dangers of fatigue and the disruption caused by handovers. Experience of this prolonged incident suggests that 2 GLOs doing 12 hour shifts, preferably with a helper on each shift, are sufficient. The report makes no hint of the idea that police should have a liaison officer in COBRA. Neither does it mention the policy, as set out in the Harrington memo, of ordering in the SAS or any other military unit over the heads of the police. As often with Whitehall papers, what is left unsaid matters the most.